In 1973, Norway became the first nation outside the US to get online through DARPA’s packet-switched network, the ARPANET. Americans had decided to connect the proto-internet to such a distant country for one reason. They were trying to keep tabs on Soviet nuclear tests. People often forget that the US defense and intelligence communities helped build the internet. The NSA, the CIA, the Department of Defense — they were all there from the beginning. But the military conducted their work through universities, which is why first host-to-host connection on the ARPANET, on October 29, 1969, was between researchers at Stanford Research Institute and UCLA. From there, the ARPANET grew to have many nodes across the US, as you can see in this GIF showing its rise and fall. In June of 1973 the ARPANET went international with its Norway connection. It was promoted as part of a project to encourage civilian research on earthquakes. But that wasn’t the whole story. American intelligence agencies had been monitoring Soviet communications from Norway since at least the late 1950s. As for the Norwegians, it was in their own self-interest to keep tabs on nuclear tests since their proximity to Soviet test sites meant that radioactive isotopes were starting to show up in Norwegian drinking water and animals. As for the Americans, they found in Norway an ally that could allow them to get close to the Soviet nuclear tests without having to enter the Soviet Union. In 1963 the US and Soviet Union signed a treaty limiting some nuclear tests by both countries. The only way to keep each other honest was by monitoring from outside their respective countries, so by 1965 the US and Norway reached a secret agreement that would allow the Americans to monitor seismic activity at a station in Karasjok. That agreement was given the code name Pine Forest and the station was operational by September of 1966. By the following year the Americans were looking to expand their monitoring operations, and ARPA (now called DARPA) was happy to foot the bill. A Norwegian military research agency partnered with ARPA for an expansive seismic monitoring program called NORSAR, which also included monitoring stations in Alaska and Montana. As Olav Riste explains in his 2014 book on the history of the Norwegian intelligence community, there were 22 NORSAR stations set up by ARPA and the Norwegian Defence Research Establishment (roughly Norway’s equivalent to DARPA) in the southern and eastern parts of Norway. By June of 1973 all of those stations were feeding information to the American intelligence community through a satellite link to the ARPANET. As researcher Olav Njolstad wrote in his 2007 paper Atomic Intelligence in Norway During the Cold War, NORSAR was supposed to look like a non-military earthquake monitoring service, which it also was. But, of course, its primary mission was firmly rooted in intelligence gathering. Despite its civilian clothing, NORSAR was a child of US-Norwegian military intelligence cooperation. Indeed, the director of the Norwegian Defence Research Establishment supervised its construction in person, and the advanced computer centre that would provide the realtime link to ARPANET was placed just outside the barbed wire fences of his institute. In a 2009 paper called Building Cyberspace by Norwegian researcher Jon Bing, we learn that internet architects Lawrence Roberts and Robert Kahn visited members of the Norwegian Defence Research Establishment in October of 1972. They traveled to Kjeller, just north of Oslo, to get the Norwegians set up with this incredibly futuristic communications technology that would lay the foundation for our modern internet. One of the major objectives of ARPA was a monitoring of seismic disturbances indicating a nuclear explosion for research purposes. This was a reason for the interest in Norway, as a granite formation starting in Russia surfaces close to the city of Hamar in southern Norway, and was monitored by the Norwegian Seismic Array (NORSAR), a neighbour institution to the Defence Research Establishment at Kjeller. Shortly afterwards, a link was established between Kjeller and University College, London (UCL). 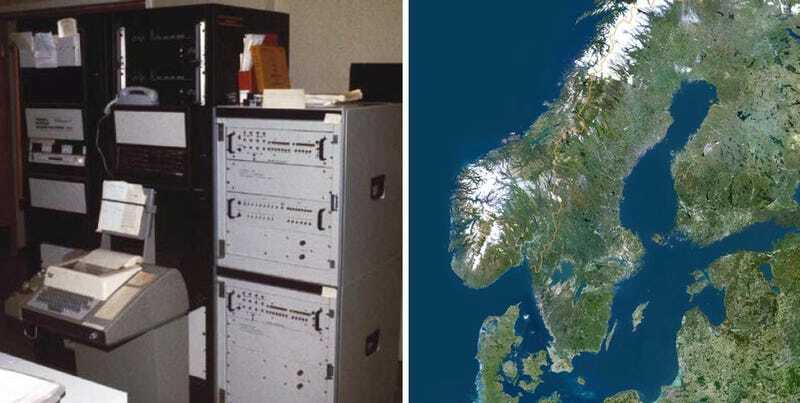 Norway therefore became the first country outside the United States to have a node to the ARPANET, just ahead of the UK. Today, NORSAR continues its scientific endeavors, monitoring earthquake activity around the world. But it makes no secret of the fact that it also measures nuclear tests, including those in North Korea. For some reason those of us here in the 21st century often imagine a fictional timeline wherein the internet was somehow free of the intelligence community and government overseers keeping tabs on everything that’s going on. But that was never the case. This is, of course, no excuse for the government’s excessive monitoring of civilian activity on the internet that has come to light in the past decade. But it certainly puts internet history in a different light. When you look at how the early internet was used by the intelligence and defense communities, you see that our internet infrastructure was never the Wild West. It was built deliberately and strategically. Some of the earliest uses of the ARPANET were for monitoring the military activities of America’s adversaries, decades before most people even knew what networked computing was.